The Mushroom Kingdom Fire Department is an organization appearing briefly in the The Adventures of Super Mario Bros. 3 episode "Reign Storm". 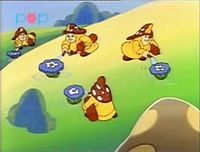 All members of the crew shown are Mushroom People. In the episode, Kooky von Koopa's Robot Princess has ordered the fire department to extinguish every Fire Flower in the Mushroom Kingdom. Unaware that the Robot Princess is a fake, the fire department is seen carrying out the job. This page was last edited on August 19, 2018, at 16:20.